Valentine's Day was always such a fun day. I liked it when I was in school. I loved it when my children were little and it was one of my favorite holidays when I taught. The simple uncomplicated nature of Valentine's Day after all the busyness and stress of Christmas is fun, festive and refreshing. The decor is whimsical. 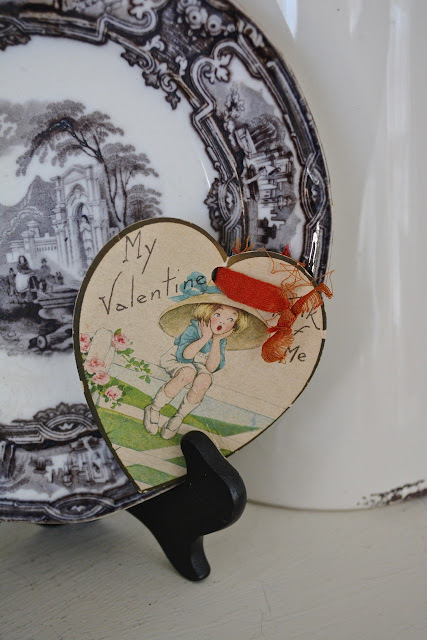 Vintage Valentines exude the whimsy that I love. 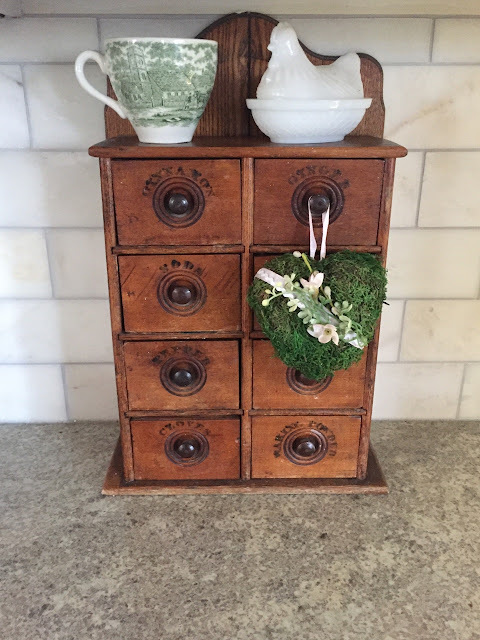 I'm so glad that Amber at Follow The Yellow Brick Home put this hop together. If you are following from Our Southern Home , welcome. Do you love her cute tablescape? My grandmother kept her extensive collection of postcards. They are now about 100 years old. 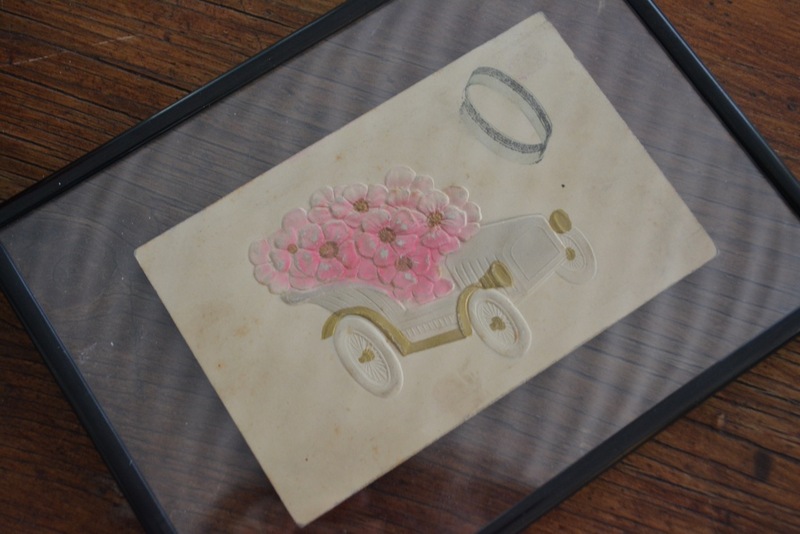 This antique car full of flowers is a postcard that was tucked away in an album that I thought was empty. These with glitter and embossing are extra special. The colors! I found some from a later era. These smaller Valentines were at my favorite craft mall. It's amazing that these have survived. We only have one vintage figurine. It was a $3.00 find at the Methodist thrift store. It's so cute! 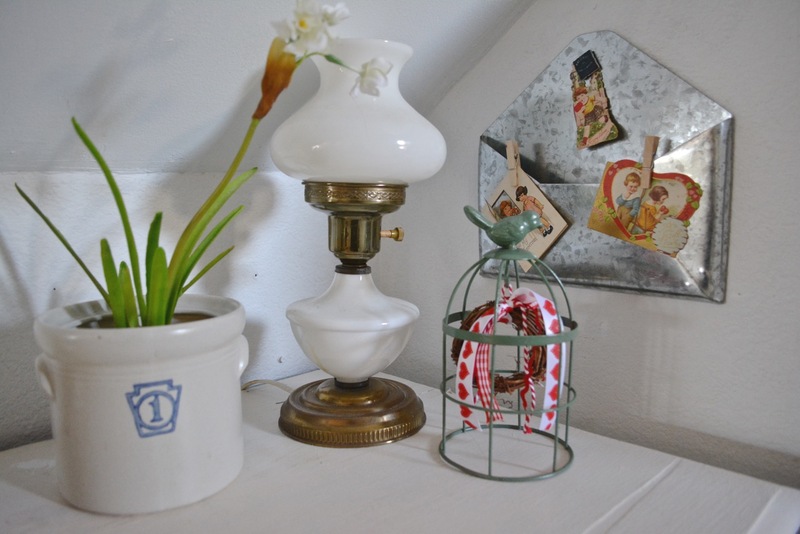 This snowman is not vintage but he's vintage inspired. It was actually a Christmas figurine that got a Valentine's Day makeover. 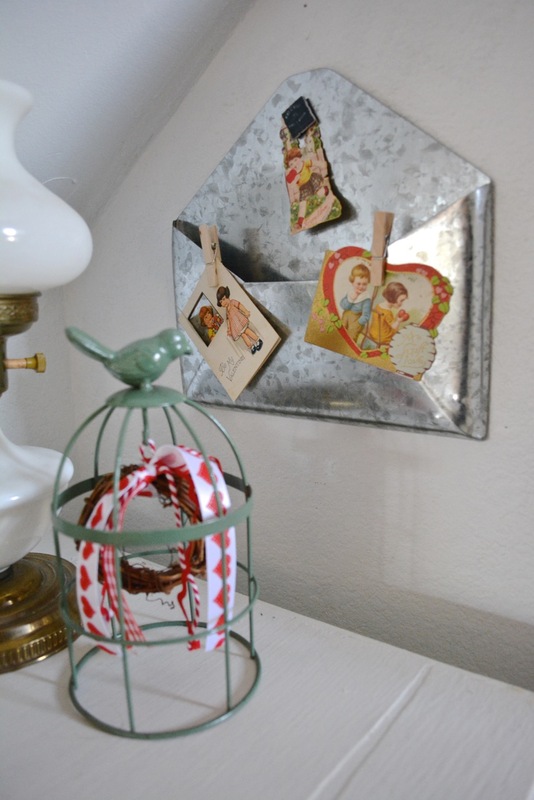 Vintage inspired hearts are a constant staple around here. 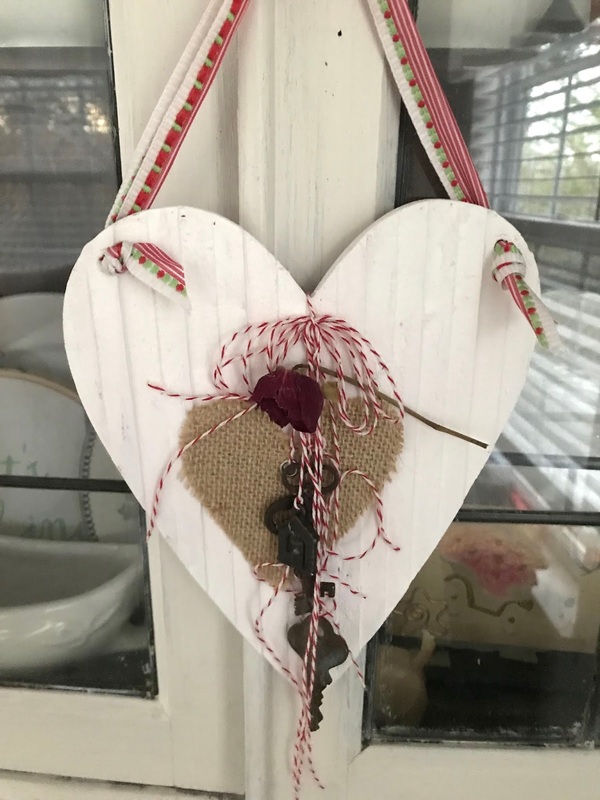 I embellished a little muslin heart with part of a collar of an old sweet dress. The dress itself couldn't be saved but the embroidery on it was precious. 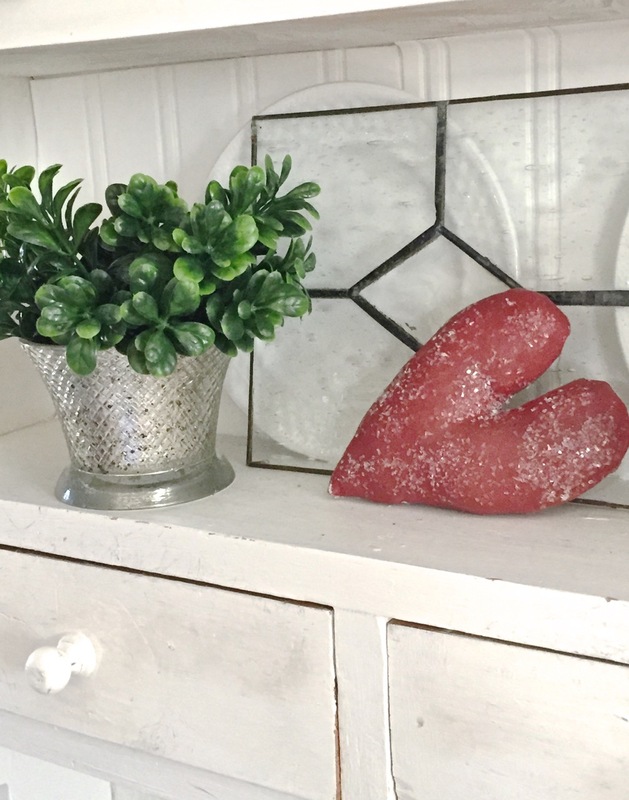 Believe it or not, the glass heart vase came from Dollar Tree. It's filled with some spring flowers. The framed art is actually a gift bag. It's my new cheap way to get seasonal art. 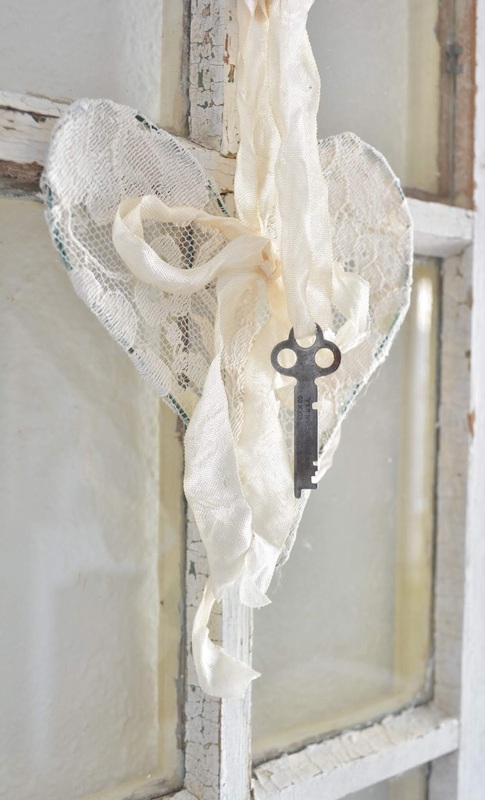 Hearts with vintage keys are always fun. Just last week I found a little packet of Valentines at the booth of my favorite crafter. This cutie was in the batch. The rest are sitting in a little heart basket for perusal. Thank you, Amber. This is such a fun hop idea. 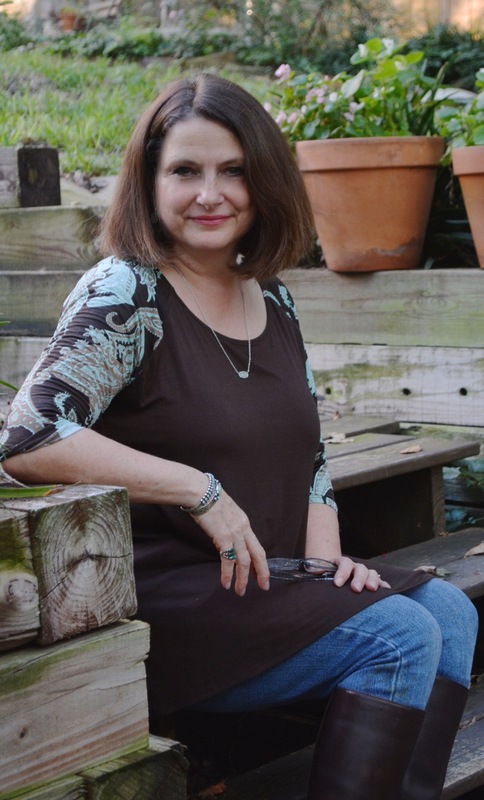 Be sure to stop in and see Judith at Botanic Bleu. She always has something French inspired. 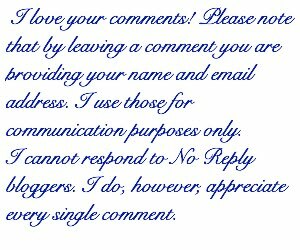 Be sure to visit the other bloggers. You won't want to miss a single stop. Delightful display vintage Valentine cards but may favorite has to be the snowman. Cute idea! 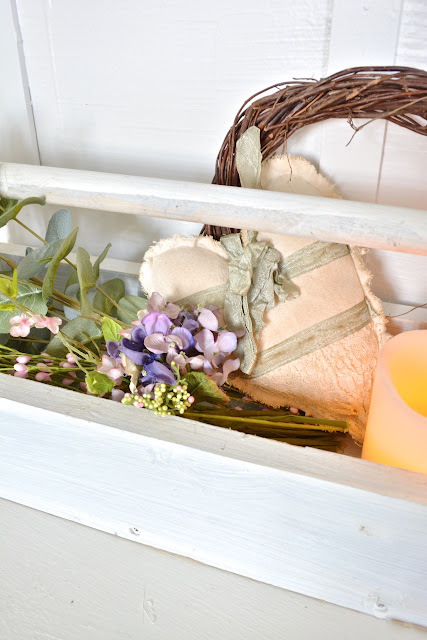 All of your sweet Valentine's Day touches are just so lovely!! 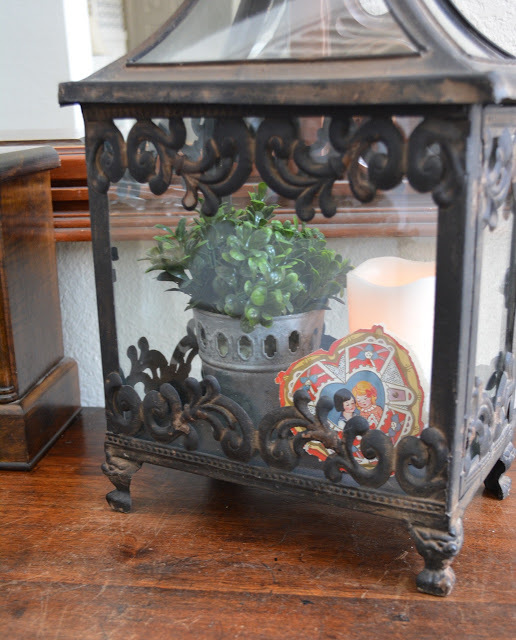 Now I want to go around and create vignettes with a few of our trinkets that are fitting for the holiday! One of my favorite memories of elementary school was creating a "mailbox" each year for classmates to deposit Valentines. Each student created her/his own decorated box from a shoebox or large envelope. Then came the shopping with my mother to find a package of Valentines to give to my friends... always a problem to find a package with enough Valentines for every classmate to receive one. Your sweet Valentines remind me of the ones we exchanged each year. So many adorable treasures! I love those vintage cards! Sweet decor for a sweet holiday. I loved V-Day when I was young and in school and your post made me remember that time of life. 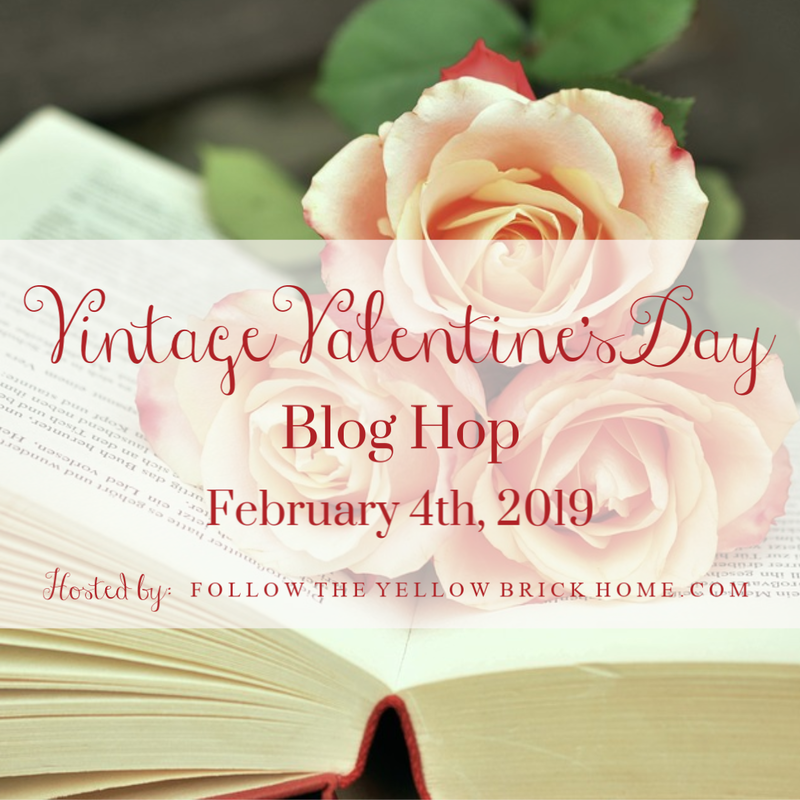 I love your vintage valentines! The ones that are embossed, with glitter are my favorites!! Hope you have a wonderful Monday!!! I would love seeing those hearts year round. Everything is so adorable. And it amazes me how you find such precious stuff. We need to shop together. I'm not that creative and I think you'd open my eyes to a lot! And I had no idea you and Judith lived so close to each other! We need to meet and get to her Christmas sale next year! Your home has so much love and the touches of Valentine's you placed in it is simply beautiful. Love your home. Happy Valentine's day. 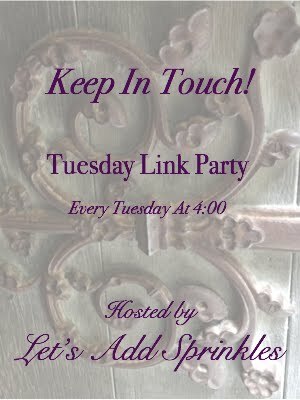 I enjoyed doing the blog hop with you! Katie, how lucky you are to have all those old Valentines from your grandmother. What a treasure. Your little figurine is so cute too. It's so nice to have such great Valentine's decor to brighten your home. Happy that Texas is well represented on this blog hop. I too love hearts despite not using many of them this year. You have such a great collection and variety of hearts. I made a moss heart and you have given me an idea on how to finish it. Great score on the Valentines and I love the postcards! Mr. snowman and your hearts are precious! 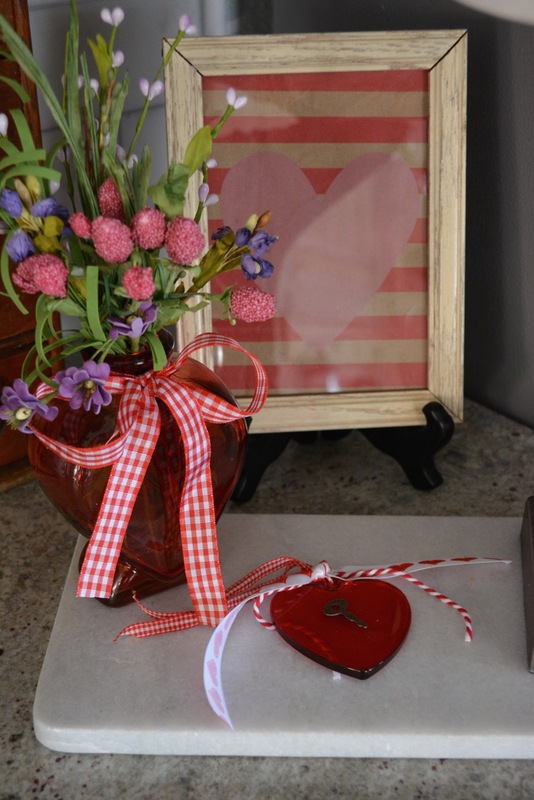 You have so many lovely Valentine's decorations, but I must say that sweet muslin heart has stolen mine! It was fun doing the hop with you! Katie you have some of the most adorable vintage valentnes. Finding that postcard inside the book must have been like Christmas! The framed valentine is especially gorgeous. I also love all of your pretty hearts! Hi Katie! So nice to get to "meet" you on this fun blog hop :) I love your collection of homemade hearts; they are just precious! All sweet and lovely, Katie. I love each and every vignette. 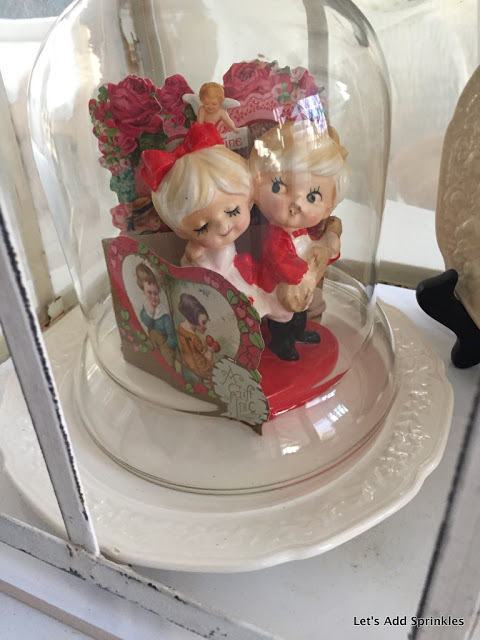 these are so very sweet, such a great idea to enclose them in a glass frame! 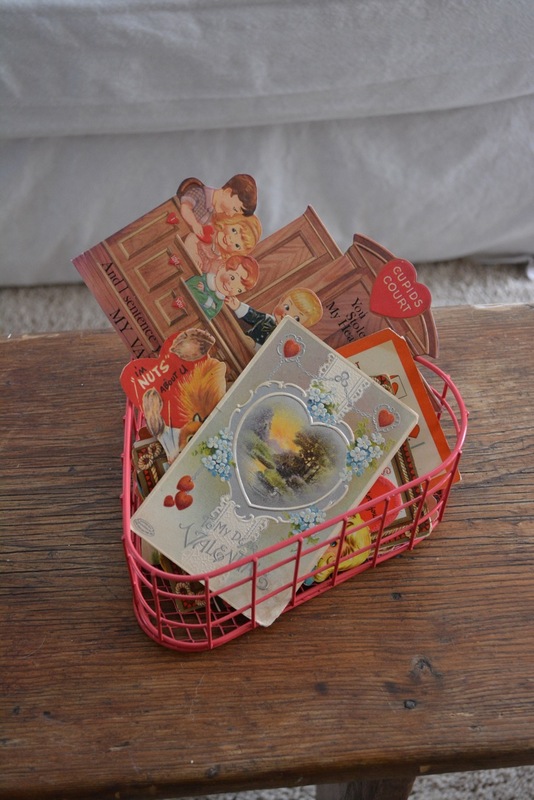 What a wonderful collection of vintage Valentine's Day cards you have and also of pretty heart decor. I like how you framed the car postcard in a clear frame so that both sides of the card can be enjoyed. 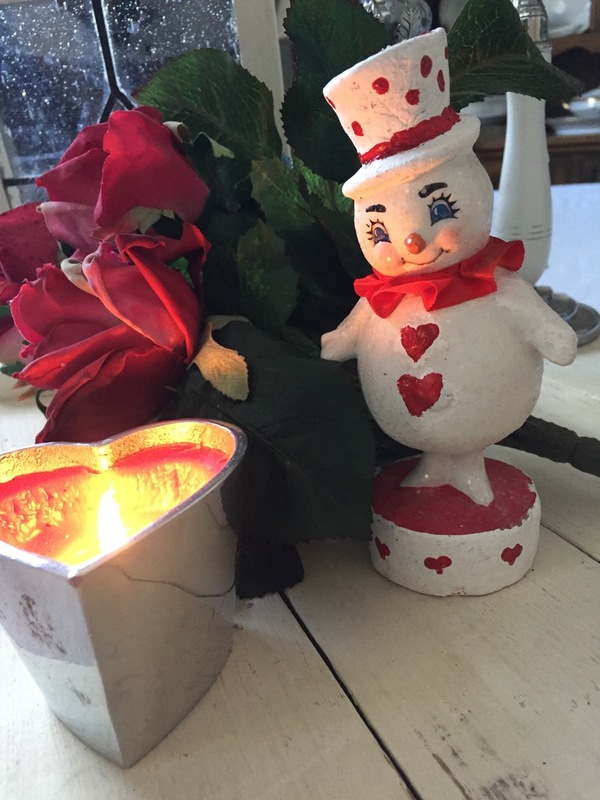 Your home looks pretty all decked out in Valentine decor, Katie! So many pretty vignettes and vintage cards and I adore the cupids. Katie, I too love Valentine's Day. It was my favorite holiday for teaching. My first and second grade students were always excited about our Valentine's party. I made it a homework assignment the week before Valentine's to write a valentine to each member of the class. They could take five names each night, and they were to writer at least one thoughtful sentence about the recipient. When the valentines were exchanged, it was heartwarming to see the children dash from one to another excited about what their valentine said. It's such a light hearted positive holiday. Of course all your hearts scattered about your home make me smile. I do the same! And the vintage valentines and post cards are charmers. The last one in the shape of a heart was certainl worth the price of the bag, but look at all the others too. Great find! Happy Valentine's Day! 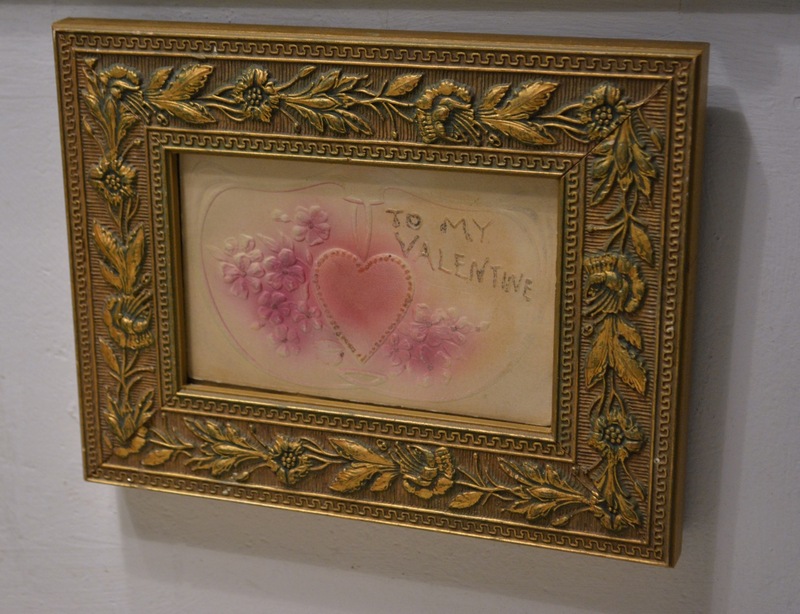 Katie your vintage Valentine's have me longing to head out to the flea markets to start searching for some. I love your displays. I hope you have a wonderful Valentine's Day! 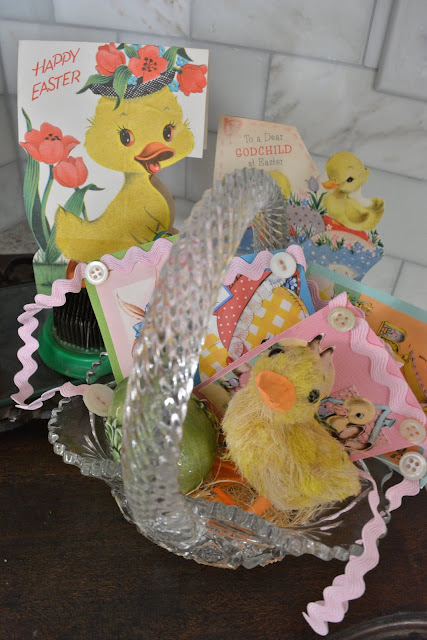 Your Grandma's vintage postcards are such a treasure! So fun to spread around the house. I'm curious...what are the little tapes under your plates and why? 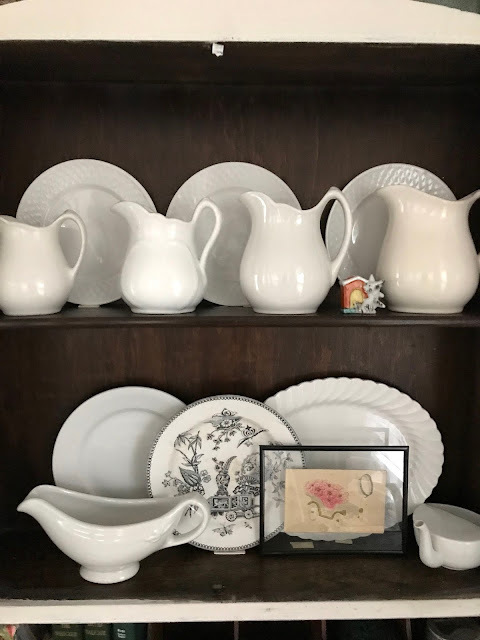 Some decor trick? What a special treasure to have your Grandmother's postcards! 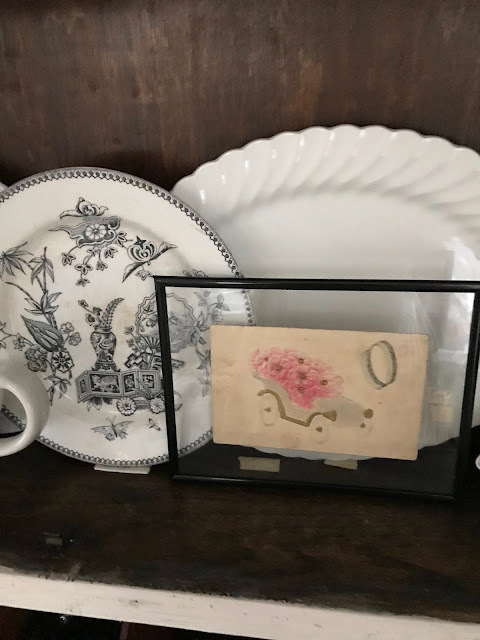 All of your vignettes are so pretty, and that vintage figurine is precious! It has been so much fun being on the hop with you! Happy Valentine's Day!! !